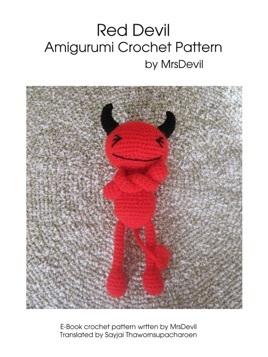 Crochet pattern to make a devil doll. This type of doll is called an Amigurumi. The design is from MrsDevil. It has been translated into English and published by Sayjai of K and J Dolls. This is a great doll to make for Halloween. You need only a basic understanding of crochet as it's an easy pattern. I just started this pattern and so far it's been easy to understand and follow along. I just started to learn how to crochet and so far I completed its body and head.